The October sky does not remind me of fall. The air does. Today I was supposed to go to work, start my shift and work until late. Then I found out there was no job for me because of an HR catch-22 so I went home again. Oh well, that gives me two days off this week. It could be worse and I have some extra time to read. At home I looked outside. It was around 6 P.M. and the sky made me take a second look. Just after half past 6 I stood outside taking pictures of the sky. F16 because the sky was clear blue, plenty of natural light. Iso 400 was enough to catch the nuances and 1/100 shutter speed captured enough details. The clear sky looks warm but the air is getting colder. Here in the Amsterdam region the Fall seems to act like summer when you ignore the earth you walk on. Today was the 13th of October though and my scarf is necessary again. It was a pleasure looking at the sky this evening. 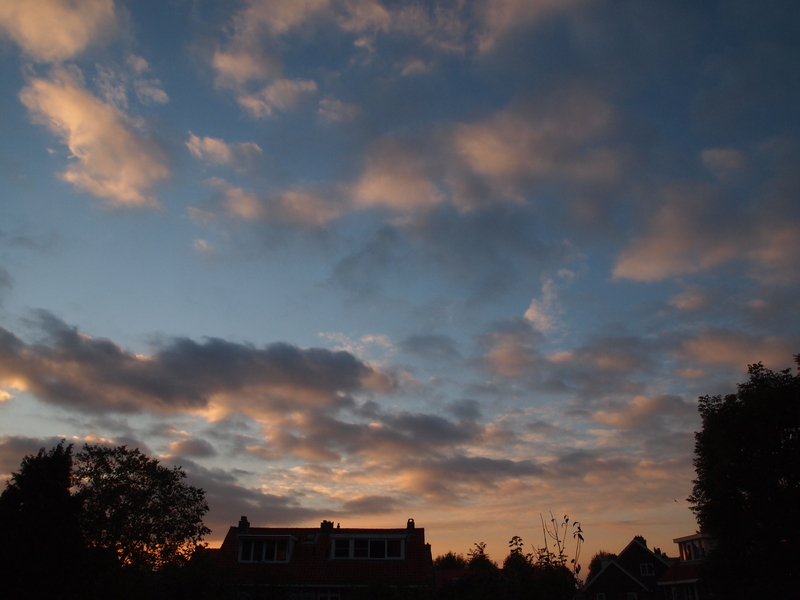 Posted in Photos and tagged 13-10-2015, clear, evening, Fall, home, light, shift, sky, time, work on October 13, 2015 by rura88.